Sept. 10, 2014, 10:20 a.m.
A new study looks at how engineers and designers from companies like Storify, Zite, and Google News see their work as similar — and different — from traditional journalism. By Mike Ananny and Kate Crawford Sept. 10, 2014, 10:20 a.m.
What are the ethics of platform design? One of the reasons that Facebook study on user emotions was so controversial is that it touched on the kinds of ethics we expect — or don’t expect — from platform designers. The public debate was divided, right down to the words used to describe what happened: science, experimentation, customization, manipulation, effect, significance, consent, harm, algorithm, users, audiences. All these words mean different things to people depending on their experiences, training, values, and expectations. And the simple summary of ethics as the “study of what we ought to do” is often unsatisfying because it invokes hard questions about who is the “we” who does the deciding, what “oughts” are up for debate, and who bears responsibility. Journalists and news technology designers are increasingly finding themselves in the middle of this debate about how platforms should work. Many people interested in journalism followed the Facebook study debate because it was, in part, about a new era of press ethics. The press’s freedom — its rights and obligations as a distinct institution — rests, in part, upon bearing responsibility to focus our attention, influence who we learn from, and affect change. But the press doesn’t bear this responsibility alone. Today, press ethics are intertwined with platform design ethics, and press freedom is shared with software designers. The people at Facebook, Twitter, Flipboard, Pulse and elsewhere have a new and significant role in how news circulates and what we see on our screens. We’re only just beginning to understand how these companies’ algorithms work and why they matter to the editorial calculations shaping today’s news. We recently conducted a study on designers of news apps and their work in this space between software design and news circulation [Digital Journalism / SSRN]. When designers create a personalized news app, they aren’t just designing software. They are creating a platform that participates in constructing an idea of news. An app can give you exactly the type of stories you’re interested in (soccer and marmots only, please) or it can suggest and display stories that it suspects you should be reading. You can, if you want, design a personal service with a preference for positive news that also avoids negative terms, something which NPR reported Google was doing in its “experimental newsroom” during the World Cup. A decision like this is significant, with wide-ranging and unanticipated effects, but it’s the latest moment in a long history of value driven news decisions. Newspaper publishers in the colonial United States were in a similar situation: “None of the early papers reached out to collect news; they printed what came to them.” Selection decisions gradually became norms of news production; they created expectations and responsibilities for journalists and publishers. Likewise, app designers are currently making choices that are reshaping our experience of everyday news reading. These emerging mobile platforms are being made by designers who must make their own decisions about what is important for news delivery. What do they value? While some traditional news organizations are creating their own news apps, mobile news also emerges from a parallel industrial culture of start-ups and commercial software design, with a different inheritance of norms and values to those associated with the fourth estate. With this in mind, we set out to understand how designers of these apps constitute what we call a “liminal press”: people and systems existing outside — but alongside — online news organizations that create the conditions under which mobile news circulates. To get a sense of how these designers understand themselves and their roles, we interviewed senior programmers, designers, and decision-makers at Storify, Zite, Google News, Emporia, AOL Editions, News.Me, Fluent News, and Scoopinion (leaders in mobile news experience design when we conducted our fieldwork in 2011 and 2012). We conducted interviews in Palo Alto, San Francisco, New York, Boston and Cambridge U.K. For this paper in Digital Journalism, we focused on two questions: how these designers define journalism as a process and as a profession; and how they see themselves as like or unlike others in the field of online news. Here’s what we found. Four themes emerged in how news app designers understood their work in relation to journalism: organizing information; meeting user demands; strategic transparency, and, at times, distancing themselves from journalism. Organizing Information: A senior leader at Storify described the company’s goal as essentially information organization — helping people pull out things they think are important and worth preserving “from the noise of all this social media.” A leading designer at AOL Editions agreed, saying that a key challenge they aimed to solve was information overload: “So you’ve got TweetDeck beeping at you, and Flipboard is always refreshing, and there’s always a new story…how do you keep up with all that?” Designers did not think that they were simply providing information but, rather, helping people “sense-make”: processing ambiguity, creating plausible meanings, and feeling in control of the surfeit of data. Meeting user demands: Part of organizing information means learning about users and delivering only the content they want to receive. For example, Zite’s co-founder says their app could teach editors what news should be: “No matter what an editor thinks is important, I’m never going to consider a story about Lindsay Lohan important, ever. I just don’t want to see that in my feed. So I think that how this transforms media is that it teaches reporters a lot more about what people are talking about, what they should be writing about.” And a senior Google News executive said that their sense of success comes not only from giving people what they want to see, but from “helping you discover things that might be of interest to you that aren’t resident in your social graph today.” For these designers, meeting user demand means not simply giving people what they say they want—it means delivering what they think users should want based on their previous behavior and the data patterns they produce. The data produced by a user is fed into a model that determines what news is seen — even when those signals conflict with what the user has asked for, or what judgments the editors might make. Strategic transparency: All the designers we spoke with wanted to tell users why they make content recommendations, with each having a slightly different understanding of “transparency.” The Google News executive aimed to highlight types of news expertise they value: “We’re starting to surface these authorship annotations to help you see who’s behind the news … to show expertise, which we believe strongly in.” This doesn’t mean Google News is going to tell you how its algorithm works but, rather, that its algorithm is going to favor reporting that it judges to be open and transparent. Heavy versus light infrastructure: Some participants described themselves as having a more open participatory framework than traditional news organizations, drawing on countless non-professionals who will contribute content to their service. One Storify co-founder contrasted his company against the Associated Press, but said that it raises a whole new set of questions: “What would you do if you wanted to recreate the AP [Associated Press] today? You know, would you build the news service by getting a bunch of offices all around the world and hire people and translators and assistants and drivers and create all this infrastructure for sending the reporters everywhere, which the AP has done?” Instead he aims to create a new kind of AP based on “curation of social media; building a platform where we enable journalists, bloggers or whoever wants to really to find the best of social media and use human intelligence.” They aim to resemble the AP’s reach and global power, but to do so without its heavy infrastructure. App designers versus mainstream media: News app designers mark their sector out as different, while defending themselves against perceived criticism from mainstream media. A senior Google News executive says that what they do is like what the press has always done: “on the one hand, I can look at some of those [aggregation] practices and easily say [it is] inappropriate leveraging of someone else’s work. On the other hand, news reporting is largely derivative work, right? I mean there are pieces of additive facts and value, but so much of news coverage, understandably, is building on prior news coverage.” Other designers described themselves as partners of news organizations, as a senior News.me developer did: “We wanted to figure out a way for publishers like the Times to get what they want, which is money for their content, which is information about the people that are consuming their content. So how do we set something up where people can consume New York Times content, outside of their walls, in a place that they enjoy, but also have The New York Times benefit, and not lose anything from it?… They can benefit from this ecosystem.” News app designers seemed to be trying to both differentiate themselves from the mainstream media (articulating the value they give them), while simultaneously describing their apps as consistent with the kind of news circulation practices the press has always relied upon. Curation versus aggregation: The dividing line between curation and aggregation emerged frequently, as a contested ground where some designers spoke passionately about why they were not “mere aggregators” and instead curating a series of complex signals, from social media and users reading patterns as expressed in metadata (time reading a story, what genres they clicked, what their friends were reading). For example, News.me distinguished itself from the basic RSS reader model: “A lot of people thought, ‘Okay, RSS is the future, RSS Reader.’ And it didn’t really go anywhere. People still use it that way. And now you see these apps coming to iPhone and iPad, particularly Flipboard and Pulse. They’re really just RSS aggregators. To this point, they’re not really doing anything behind the scenes other than like a different presentation.” The designers saw their algorithms as providing a kind of critical, signal-driven curation, a key distinction from a history of simple aggregation they saw their systems challenging. We continually heard designers invoke different traditions and ideologies. They talked about journalism as an information-focused practice and the need to give people individual, personalized views of the Internet’s surfeit of data. They described news consumers in customer-like ways, aiming to create designs that would meet their demands and desires. They judged success in terms of how large their audiences were. Some of them questioned their relationship to journalism altogether, distancing themselves from what they saw as the press’s outdated and complex infrastructures; instead, they aimed to create lightweight architectures that used crowd-sourced, participatory labor to do the work of news professionals. That is, instead of seeing simple divides between algorithms and editors, between curation and aggregation, between “old” or “new” journalism, we saw a complex mix of motivations and self-stated identities. News app design seems to constitute an emerging organizational field: a “community of organizations that engage in common activities and are subject to similar reputational and regulatory pressures.” Our interviewees invoked and rejected the traditional press — sometimes differentiating themselves from it and other times aligning with it, while not always even agreeing on what “it” is. Although this is an early step in characterizing this hybrid press of entrepreneurs and technology designers, much of what they do certainly resembles a kind of boundary work considered key to contemporary online journalism. The Facebook study and the discussion emerging from it highlighted the need for journalists to understand how social media signals are interpreted, manipulated, or monetized by platforms like Facebook. But it also showed their need to have conversations with software designers outside of their own newsrooms — to talk across divides between algorithm and editorial that live beyond their organizations, to create new ethics of press responsibility. 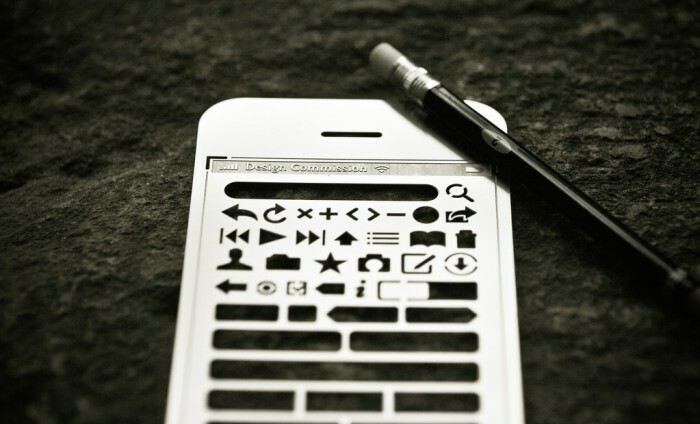 Photo of an iPhone stencil by Robert Occhialini used under a Creative Commons license. POSTED Sept. 10, 2014, 10:20 a.m.
Ananny and Kate Crawford, Mike. "Designer or journalist: Who shapes the news you read in your favorite apps?." Nieman Journalism Lab. Nieman Foundation for Journalism at Harvard, 10 Sep. 2014. Web. 19 Apr. 2019. Ananny and Kate Crawford, Mike. "Designer or journalist: Who shapes the news you read in your favorite apps?." Nieman Journalism Lab. Last modified September 10, 2014. Accessed April 19, 2019. https://www.niemanlab.org/2014/09/designer-or-journalist-who-shapes-the-news-you-read-in-your-favorite-apps/. | title = Designer or journalist: Who shapes the news you read in your favorite apps?